Auckland is my playground. I live here and thrive on the vast number of inexpensive and free things to do in Auckland. It’s an ideal city for those seeking relaxation, entertainment, culinary excellence, cultural experiences, or adrenaline rush activities. Reflecting the natural beauty one expects to find in New Zealand, it is nestled between two major bodies of water. It is my city. Lush green parks line the city’s 1,600km of sparkling blue coastline. Visitors rarely find themselves more than 5km from the sea. On sunny weekend days, it is easy to see why Auckland has been nicknamed the City of Sails. There are so many fun things to do in Auckland. It is a city made for walking, cycling, sailing, dining, relaxing, or a bungy jump. It is home to impressive museums, tempting restaurants, and colourful nightlife. While there are plenty of things to do in Auckland for free, to round out the list, I have included several special activities that are not so free (labelled with $). Founded in 1840, Auckland’s short history includes influences from the indigenous Maori people. Today, it is home to nearly one-third of the country’s population. It has earned a reputation as a family-friendly, active, and safe city. 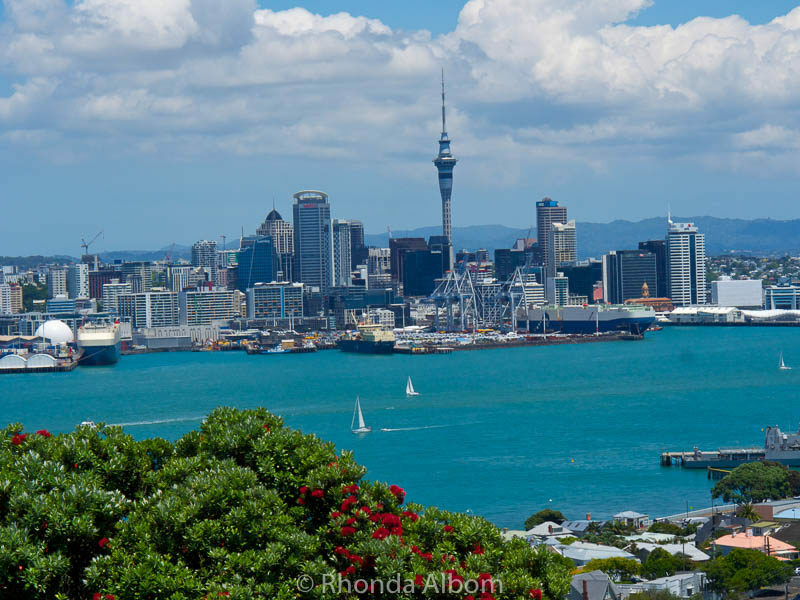 14 With so many free things to do in Auckland, why would you ever want to leave? The city sits on the remnants of 48 dormant and extinct volcanoes. Some of the best views in the city are found at the summit of volcanoes in Auckland. Morning is a great time to climb an Auckland volcano, although if you prefer driving several offer car parks at the top. View of the Mt Eden crater and city from the summit of the volcano. 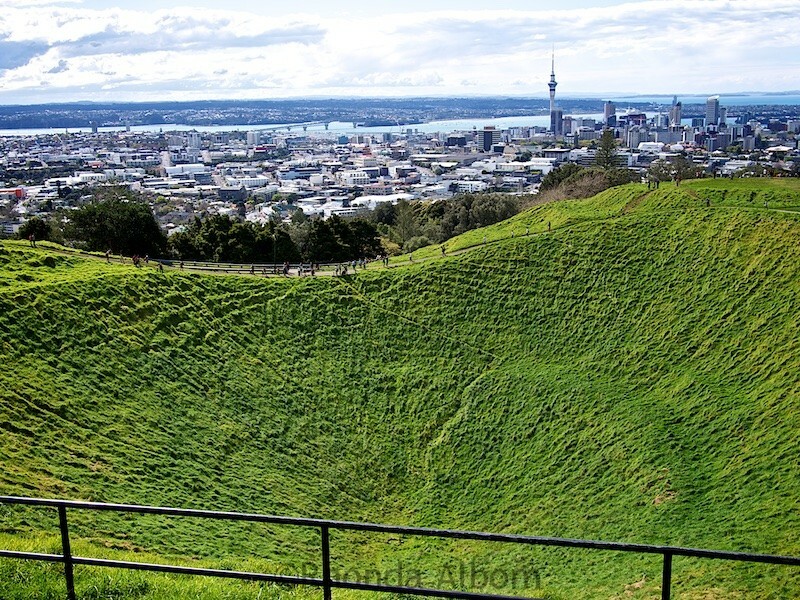 Mount Eden Volcano – Enjoy a short walk to the summit of the Mount Eden domain where you will find dramatic 360-degree views from the highest natural point in the city. However, it is the 50-metre deep crater (now grass covered) that many consider the highlight of this visit. Auckland Domain – Auckland’s oldest park is home to extensive forested walking trails, impressive sculptures, and plenty of spots for picnic or sport. Here you will find the Auckland Museum, Wintergardens, Wintergarden Cafe, and the city hospital. One Tree Hill – This is Auckland’s second largest volcanic field, also offering lovely views, a historic obelisk, the gravesite of a national hero, and today you will find several youthful trees, replacing the “one-tree” that was destroyed in protest. 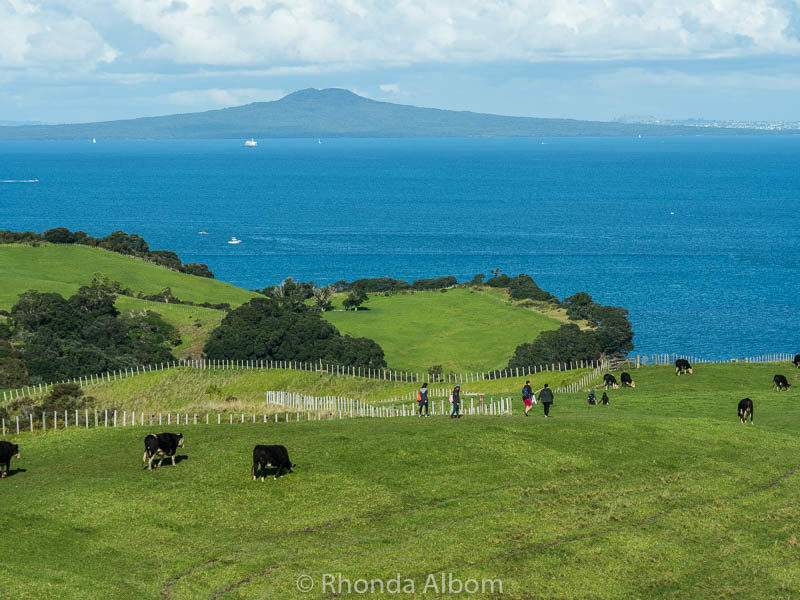 Rangitoto Island – Auckland’s youngest and largest volcanic field can be seen from most north facing city views. Daily ferries go out to e Rangitoto and other Hauraki Gulf Islands from the Auckland or Devonport. From the summit, enjoy spectacular city views, explore lava caves, overlook the world’s largest Pohutukawa forest, or watch the sunset. Although a moderate level of fitness is required for hiking to the top, tours are available that will take you up on a 4wd tractor-pulled tram. Mt. 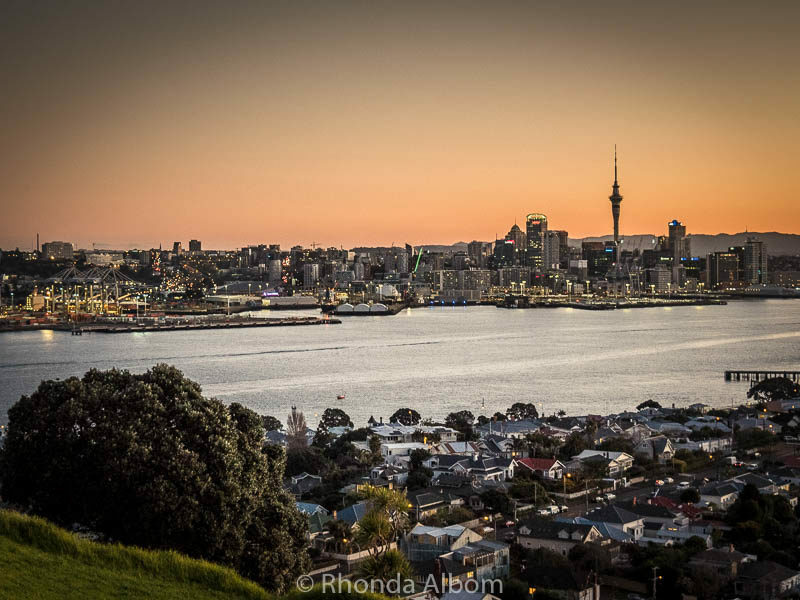 Victoria in Devonport – My favourite view of the Auckland skyline is seen near sunset from Mount Victoria, a hill directly across the Waitemata Harbour from the city. Also at the top are iconic red and white “mushroom” painted vent caps dotting the fields, a tourist favourite photo spot. There are both buses and a ferry that travel between Auckland city and Devonport. 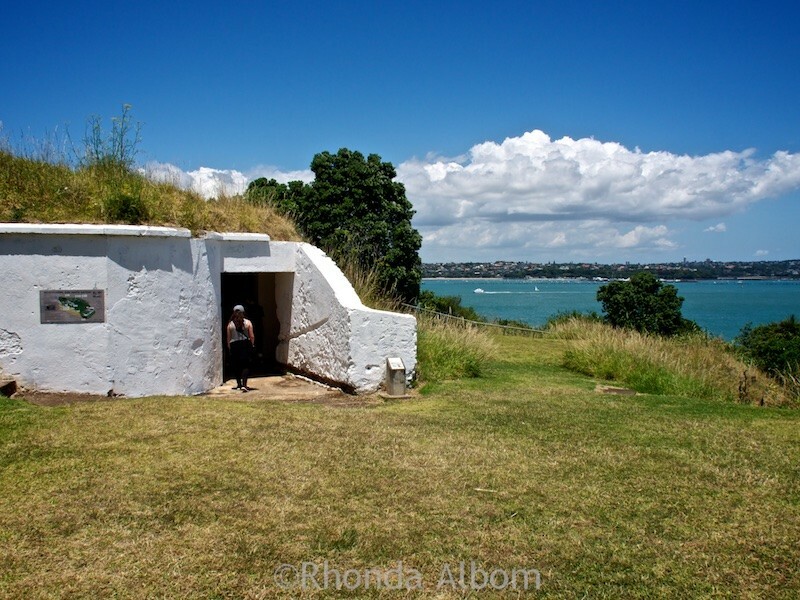 North Head Historic Reserve in Devonport – As you enter the former military tunnel complex hidden in the hillside at North Head, you leave behind expansive panoramic views of the Hauraki Gulf and Auckland city. It is easy to understand why North Head was a coastal defence site. Entrance to one of the tunnels at the North Head Historic Reserve. Here are a few of the best walks in Auckland. Coastal path – With so much coastline, there are miles of beachfront path options. Two of my favourites are Tamaki Drive from the city to Mission Bay and the coastal path from Milford to Takapuna (one of the best things to do north of Auckland). Coast to Coast Walk Auckland – Fairly unique to Auckland, you can walk across the country from the Waitemata Harbour to the Manukau Harbour. In about 5 hours you will pass suburban streets, five volcanic fields, and several historical sites. Wynyard Quarter: This redeveloped district is an ideal spot to enjoy a meal at one of the waterfront restaurants, bring kids to a large playground, visit a community garden, or just relax on giant wooden recliners. Heritage walk – Take a self-guided tour of some of the city’s most historically significant and beautiful heritage buildings. Walk or cycle on the Te Ara I Whiti. This former motorway turned into a pink lightpath lets pedestrians and cyclists bypass the autos on the city roads. Westhaven Marina – With over 2,000 boats, it’s the largest yacht marina in the southern hemisphere. ⇒ Check Auckland Transit for more free walking routes in the city. Auckland Botanic Garden – roam through the 156 acres (including 10 acres of native forest) that attracts nearly one million visitors annually. Parnell Rose Garden – Be enchanted by the over 5,000 flowering bushes in springtime. Domain Wintergardens – Originally built in the early 1900s to provide garden viewing in the winter months, today the Wintergardens have a fernery, an ornate courtyard, and two Victorian-style greenhouses. Inside one of the Victorian-style greenhouses of the Domain Wintergardens. Each of the 36 regional parks offers something different, but all have opportunities for hiking in Auckland. Nevertheless, I do have several favourite urban parks. Black swan at Western Springs Reserve. 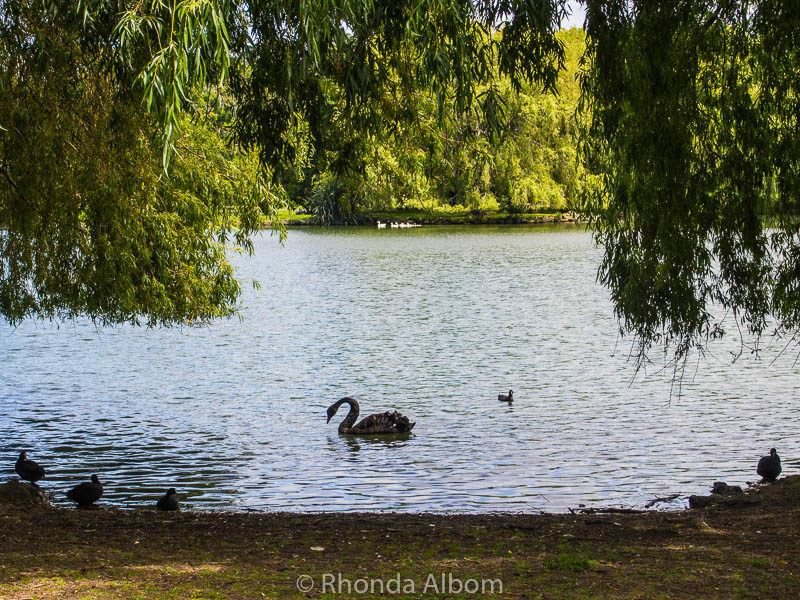 Western Springs – A flock of black swans live on the artificial lake that was originally built (1875) as a reservoir for Auckland water. Cornwall Park – A peaceful park with tree groves, gentle walking paths, sheep and cattle, playground, and two historic buildings. At one end of Cornwall Park is One Tree Hill volcano. Shakespear Park – Hike through paddocks and on trails at Shakespear Park at the end of Whangaparaoa Peninsula. The park is home to the only mainland little-spotted Kiwi birds; although you won’t see them, sometimes at night you can hear their call. Shakespear Park with Rangitoto Island in the background. Waitakere Ranges – There are over 250km of sub-tropical rainforest trails making up the Waitakere Ranges walks and plenty of waterfalls. The trails range from family-friendly to the 80km multiday Hilary Trail. Important, as of April 2018, many of the trails are closed to protect the trees from Kauri Dieback. Here is a list of open trails. Arataki Visitor Centre – The gateway to the rainforest, the Arataki Visitors Centre has stunning views overlooking the rainforest, information on the parklands, extensive Māori history and several impressive carvings. It is one of the highlights of West Auckland. Manukau Heads Lighthouse – Climb to the top of the lighthouse and be rewarded with stunning harbour views over the Awahiti Peninsula. Tiritiri Matangi – Take a ferry ($$) out to the bird sanctuary island of Tiritiri Matangi. Here you will discover several species of endangered birds including the once thought to be extinct Takahe. ⇒ Book the Ferry to Tiritiri Matangi with a 1.5 hour guided walk and free time to explore. There are plenty of things to do in Auckland city on a rainy day. Entry to most of the art museums is free, while several other museums offer free entrance for locals. 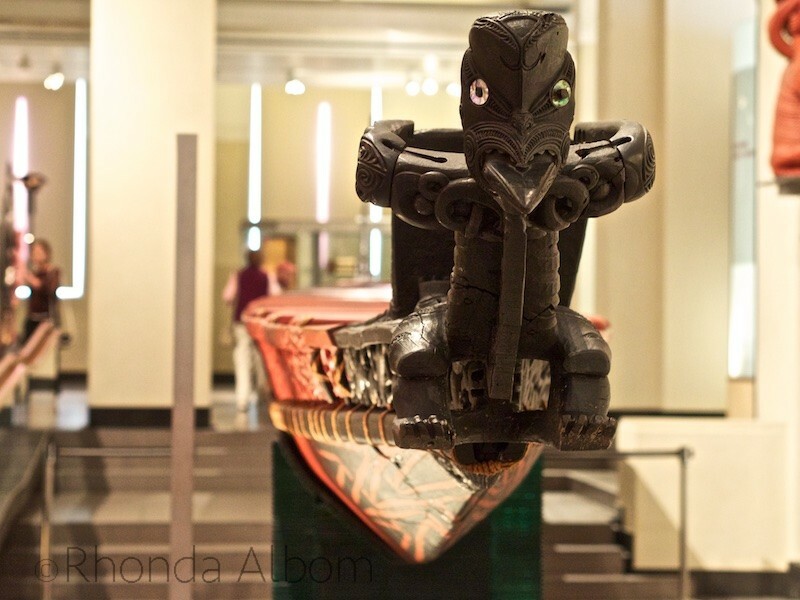 Maori Waka (canoe) at the Auckland Museum. Auckland Museum (Free entry for Aucklanders) – An Auckland must-see destination for visitors who want an insight into New Zealand’s history. The museum boasts one of the world’s most impressive collections of Māori and Pacific Island artefacts. And, the top floor is home to The Auckland War Memorial Museum. Auckland Art Gallery Toi o Tāmaki – Home to over 15,000 artworks including paintings, sculpture, and multimedia, it’s New Zealand’s largest collection of national and international artwork. New Zealand Maritime Museum (Free entry for Aucklanders) – From the dugout canoes that brought the first Polynesian people to modern world-class racing vessels, New Zealand’s nautical history comes to life at the National Maritime Museum. Pah Homestead – Worth a visit to see either the historic home or the frequently renewed contemporary art collection. Te Uru Waitakere Contemporary Art Gallery, Auckland – Located in Titirangi, the contemporary art galleries of Te Uru will be different on almost every visit. MOTAT ($) – Auckland’s Museum of Transport and Technology is a hands-on opportunity to discover the country’s advancements in transportation and technology. A day at MOTAT and the nearby Auckland Zoo would be one of the best things to do in Auckland with kids. Art fans may want to check out this art tour ($) that will introduce Auckland’s vibrant art scene while visiting up to six galleries, including exclusive access to venues. Window shoppers can consider these options as free things to do in Auckland. If you’re a collector, you will have a different experience. Queen Street – Every city has a street that does it all; in Auckland, this is Queen Street. This main thoroughfare is the heart of the central business district (CBD), a shopper’s paradise, and a tourist destination. Otara Flea Market – A Saturday morning market located in the car park of the Otara Town Centre. This is the largest Polynesian-style market in New Zealand. City Farmers’ Market at Britomart – Also on Saturday mornings, this farmers’ market is the place to get fresh produce. Sylvia Park Shopping Centre – This is New Zealand’s largest indoor shopping mall. K-Road during the day – On Karangahape Road you will find an eclectic mix of fashion, second-hand shops, art galleries, and vegetarian cafes. Auckland Night Markets – At seven different locations throughout the city. Birds are the main wildlife spotted, although sheep, cows, and deer each outnumber people. Gannet Colony at Muriwai Beach – Late August to March is the best time to view the colony of up 1,200 Australian Gannet pairs that fly over 2,000 km to breed on Muriwai’s cliff top. Goat Island – This wildlife/marine sanctuary is one of many popular day trips from Auckland. It is the best spot near Auckland for colourful (subtropical) snorkelling, SCUBA diving, or a glass-bottomed boat tour. BaristaCats Cafe ($) – If you want a more intimate animal encounter, Barista Cats Café offers animal lovers (age 10+) a place to enjoy coffee or tea while surrounded by furry friends. Auckland Zoo ($$) – A family destination featuring New Zealand’s largest collection of native and exotic animals, as well as traditional animals found at zoos. 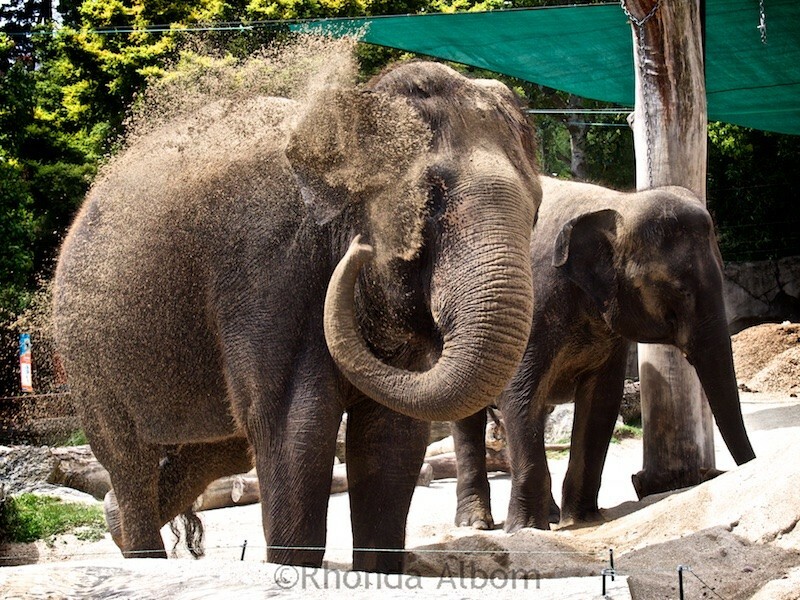 Elephants at the Auckland Zoo. Butterfly Creek and Dinosaur Kingdom ($$) – A place for kids explore a tropical butterfly house or travel back to a time when dinosaurs ruled. Kelly Tarlton’s Sea Life Aquarium ($$) – From the penguins in Antarctica to the sea life in local Auckland waters, if it lives in the Southern Ocean, you will find it at Kelly Tarlton’s Sea Life Aquarium. Built underground, it houses the world’s first walk-through acrylic tunnels that surround visitors with colourful marine life or shark-infested waters. Auckland Whale and Dolphin Safari (AWADS) ($$$) – Every moment on an Auckland Whale and Dolphin Safari is exciting, but nothing tops the day’s first whale sighting. Not free, but it is the best thing I have ever done in Auckland. If you know where to look, there are plenty of things to do at night in Auckland. Many of the hotspots are free before 10 pm. If hitting the bars is on your free things to do in Auckland list, get an early start and have your hand stamped. This will allow you free return later. SkyCity Auckland Casino (Free to enter, pay to play) – New Zealand’s largest casino is always open. Stardome Observatory and Planetarium ($) – A planetarium experience followed by outdoor telescope viewing. K-Road at Night – Karangahape Road is different at night when it’s the place to go for mixed and gay bars, strip clubs, and brothels. Free Movies in Silo Park – A summertime event on Friday nights. Poetry Live – Tuesday nights at the Thirsty Dog Tavern and Cafe features New Zealand’s longest running dedicated poetry event. 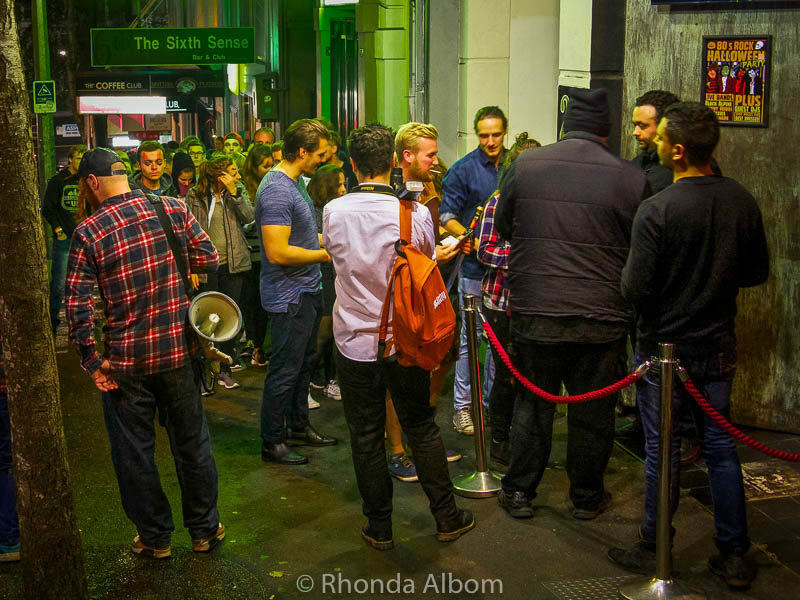 Rock Bar – The place to sing karaoke on Queen Street. Classic Comedy Club ($)- The only full-time comedy club in Auckland. Caluzzi Bar and Cabaret ($$) – A complete night out featuring a hilarious drag queen cabaret show and delicious dinner. Frenzi Bar Crawl ($) – Every Thursday night this bar crawl starts at the Camel Bar. Or if you want to go it alone, find our favourite clubs are here listed amongst these things to do in Auckland at Night. Dinner in Auckland – Find our current favourites amongst these 20 Unique Restaurants in Auckland. If you are still wondering what to do in Auckland, take a look at a few more ideas. Enjoy a picnic in a reserve. Fish from a pier or beach (check the local rules). Surf one of the west coast beaches. Swim or sunbathe at a gentle east coast beach. Collect cockles and have a barbeque in Shakespear Park. See the super yachts docked at Viaduct Harbour. Attend a lecture at one of Auckland’s 55 City libraries. Listen to live music in the park at various venues throughout the summer. Look for hand and footprints of famous Kiwis at the Auckland Celebrity Walk. Visit Holy Trinity Cathedral is the world’s only architectural example of a Pacific-Gothic cathedral. Hunt for graffiti and street art. Bottom Row: Auckland Celebrity Walk; Street art on these stairs tell the story of women’ suffrage in New Zealand. Whether you are looking for the adrenaline rush activities or just a bit of excitement, Auckland has something for you. A country known for pushing to the limit, many of these are once in a lifetime opportunities. Escape Masters ($$) – Escape rooms on Queen Street. Rainbow’s End ($$) – New Zealand’s largest theme park. America’s Cup Sailing ($$$) – Participate in the sailing of an America’s Cup yacht. Eco Zip Adventures ($$$) – Zip lines on Waiheke Island. Skyscreamer ($$$) – Catapult into the air on a reverse bungy ride. Sky Tower ($$) – The Auckland Sky Tower is the tallest manmade structure in the Southern Hemisphere standing proudly at 328 metres. A visit to the top provides impressive 360° views stretching out 80 km in every direction. Sky Jump or Sky Walk ($$$) – an adrenaline rush from the top of the Sky Tower. ⇒ Check prices on Sky Jump and Sky Walk. Auckland is an easy city to get around. There is excellent public transportation inside the city, and less frequent options in the surrounding areas. If you rent a car, remember, parking in the city is often expensive. We use RentalCars.com when we travel, as they find the best deals and have amazing customer service. Taxis are available at busy downtown venues, or taxis or Uber can be called. The Hop-on Hop-off bus is a great way to see some of the highlights. With so many free things to do in Auckland, why would you ever want to leave? Those pictures are beautiful, I would love to visit your place. 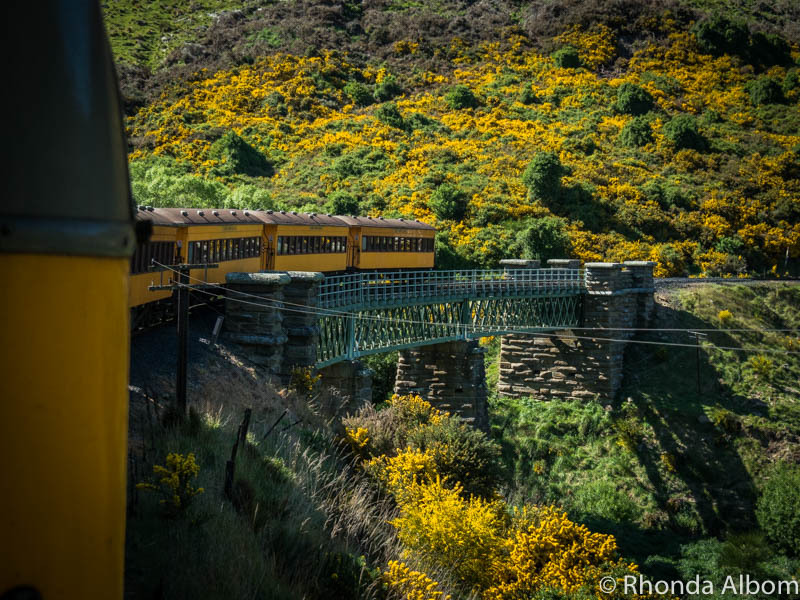 I’ ve always enjoyed visiting Aukland, Rhonda. You certainly give a brilliant outline of all the fun things to do there! 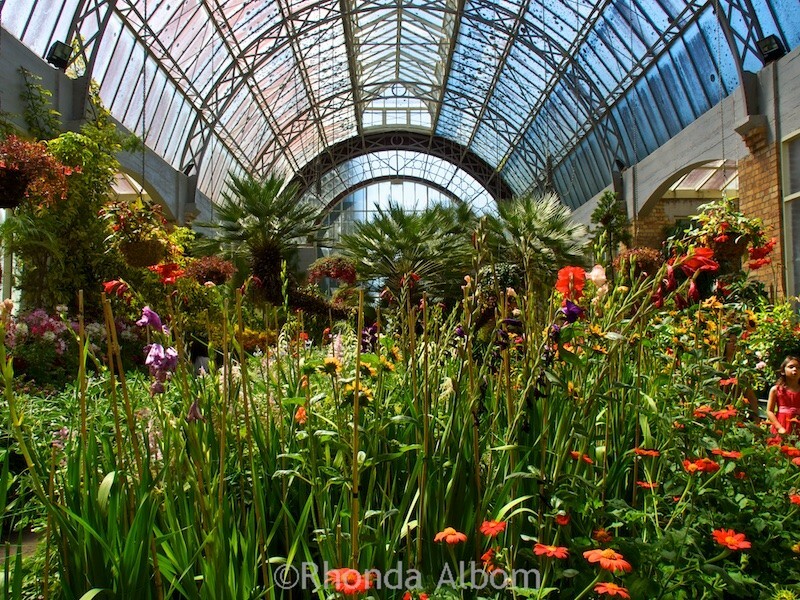 The Domain Wintergardens greenhouse is just beautiful! I’m a big garden/botanical adventure kinda gal so I’ll for sure be hitting up all those recommendations. Such a great list and I can’t wait to visit someday! I have never really researched Auckland, but it definitely looks like my kind of city. I love having the convenience of a lot of things going on and a lively city, but I also want to be out in nature and from your extensive list it seems Auckland combines the best of both of those worlds. Sign me up for star gazing, collecting cockles and having a barbecue on the beach and visiting the volcanoes. The summer movies in the park also sound fun. Auckland has so many different things that it’s great for everyone. We chose it as our home because of the balance between green and urban. This article is a boon! There’s no better advice than advice from a local. I would love to hike (or drive) up the volcanos for panoramic views of the city! The scenery there looks stunning. The Auckland Museum sounds really interesting. The walking tours sound great too, especially the coast to coast trail. How amazing that you can go across the country in 5 hours! Going to the volcanoes is one of my favourites. We go every time a friend is in the city, or even if they’re not we go anyway. I have a friend who just returned from New Zealand. Her pictures were amazing as are yours! I didn’t realize there were so many volcanoes there. The natural beauty is outstanding. I just wish it wasn’t such a long plane ride from the States. New Zealand is a great landscape for stunning scenery. I hope your friend enjoyed her time here. Bookmarked your article, it’s going to be super useful. Since, New Zealand is an expensive destination, particularly for people from Asia like me. So, every penny counts on the trip. It’s awesome to know that there is so much to do and see while spending so less. I always think the key to a good travelling budget is trying to find free things in each place. Sometimes, you have to spend money, but normally there’s a cheaper and better local option. The volcanoes blend in so easily to the landscape it can actually be a little unnerving once you stop and think about what you’re standing on. However, they’re all totally safe. New Zealand’s green, clean image definitely influenced our move here. Even though it’s a city, Auckland still lives up to that image. Wow what an amazing comprehensive list!! I love all the parks you included and places to enjoy some live music!! Pinned for later!! New Zealand is full of beautiful parks. We actually live quite close to one and go for hikes on the weekends. The one downside of New Zealand is that since it’s so far away, travelling can be expensive. However, once you get here it’s definitely worth it. New Zealand is definitely on my bucket list. It looks beautiful there. Even in the city. And, wow, I didn’t know there is volcanoes in a middle of the city. There’s actually 56 of them scattered around the region, but only one is considered active. New Zealand certainly is beautiful, but Auckland can often be overlooked. This list is full of awesome ideas! I can’t wait to visit New Zealand and will be saving this for when I go. Always need to know about the free things to do! I am definitely saving this for when I finally visit Auckland. I would have thought it was so expensive there but your list is amazing and shows you don’t need to spend a lot of money to enjoy it. It seems like you can see so much just by walking. 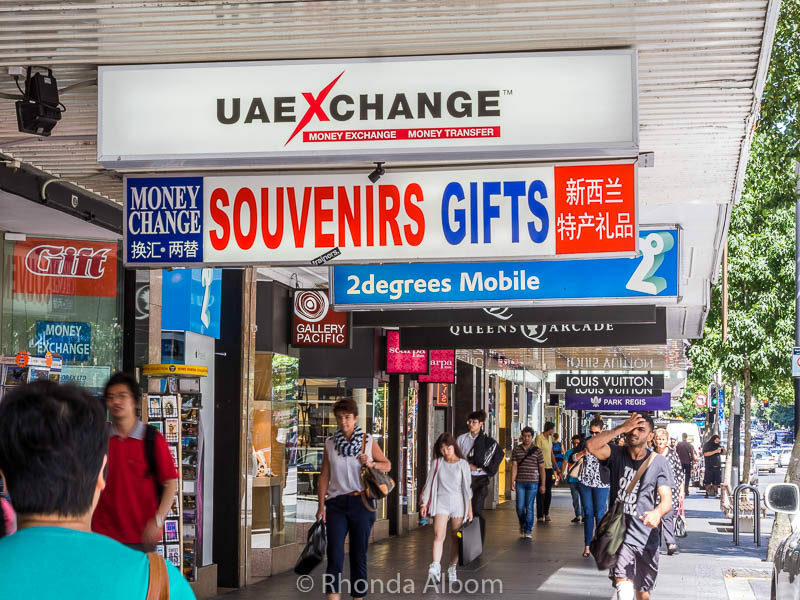 Over the years, I’ve noticed how expensive Auckland is portrayed as, yet when we go up for a day trip we can always find something cheap to do. I hope you make it here. I didn’t know that there were so many free things to do in Auckland. I love that you can walk so many different areas. And who knew that they had a goat island! I’ve been seeing cat cafes pop up in a lot cities from LA to Beijing! The walks around New Zealand are all stunning. I really enjoy how Auckland walks range from short strolls to massive hikes. The normality of the volcanoes can be a little unnerving at times once you start to think about them. However, almost all of them are dormant. Once again I have to say Rhonda, the picture of the city is beautiful. The entire blog has me wondering why I don’t live there. Amherstburg is OK must this area is very boring. The only thing about this area is the weather. It doesn’t have hurricanes, tornadoes, floods, fires that burn out the entire area and we get the 4 seasons as they should be Spring, Summer, Fall and Winter. Oh well. See ya. The weather in New Zealand can change very quickly, but on the whole, we normally have some semblance of the four seasons. That’s the most elaborately compiled list of things to do in Auckland I have seen. Guess I need to get rid of that Lonely planet now:) Jokes apart that really a great list. Guess you have travelled Auckland thoroughly! I’ve written quite a lot about Auckland, so a lot of research has gone into making this post. I’m glad you enjoyed it. What an awesome comprehensive list of things to do in Auckland! I like particularly that you also included nighttime things to do in Auckland. Although we’ve been once it wasn’t with enough time to leave the city and all its got to offer. The volcanoes and trail walks are now definitely on our to do list when we return! Some of the museums are only free to Aucklanders, but even so, I think they’re worthwhile. The maritime museum especially is one of my favourites. Auckland, Auckand, Auckland. She has avoided me all these years of travel, but someday…maybe in a couple of years Jim and I will get there. We have never done anything on the North Island, so it’s a must. Every single one of the walks sounds great. I’d love to see the gannett colony and of course would have to view those volcanoes up close and personal. So many things to do and all for free. Auckland has so much range as a city. Thanks for sharing. I know a newlywed couple who are going to Nrew Zealand in their honeymoon so I will e-mail this blog post to them. There looks like so many fun things to do there. we would definetely go for the Dinosaur Kingdom. The kids are now in the “Dinosaour fever”. Maybe I have had a bit of influence on it, but I prefer them leaning dino’s names than watching TV. Fair enough. When my girls were younger, we would study the different periods and the different types of dinosaurs in each. They loved it. I agree! Auckland is a fabulous city and you dont have to spend a fortune to enjoy yourself. We took the kids to the Basement Theatre comedy night and it ws $5 a ticket! It was such a bargain, so cheap for an evenings entertainment. Loved this extensive list Rhonda, thank you! Thanks Liz. I don’t know the Basement theatre comedy club, but will have to check it out. Oh my my!! I didn’t know one can enjoy luxury even on budget in Auckland. Thanks for writing this post, I can now visit Auckland knowing that I can do much for free. If you look in the right places, you can often find free things to do anywhere. Looks like there is tons to do there without spending any money which is great as the flight there would be pretty expensive for us. The art museum sound like a real unique experience with the local art there. What an incredible looking city too. It makes you want to go for one of those walks. Yes, as we are so far away from everywhere, airfare is never cheap, and accommodations and food generally aren’t either, so having free things to do is a big help. I wish my husbands work would take him downunder, but sadly I believe it will be a while before we make it that way as it is just to long of a flight to make with children. Someday. So lovely! Actually, when our kids were little they generally did better on the long-hauls than their parents. LOL. Seriously, they slept most of the way, and even in coach, they were small enough to be able to get somewhat comfortable in the seats. Yes, Auckland is a volcanic city and you can see the old cones from just about everywhere. This is awesome! for anyone who is traveling on a budget, this is really helpful. Thank you for sharing and i will sure to save this for future reference. Thanks Jen. New Zealand isn’t generally thought of as a budget destination, but there are ways to make it more affordable. Rhonda, this is such a great resource. I’d love to travel in New Zealand someday. Mostly I want to visit because my favorite Sauvignon Blancs are made there, but a stop in Aukland would certainly be on my itinerary. I love how you’ve broken this into categories for easy researching. I’ll want to refer back to the sections on city walks and things to do at night, for sure! Plus, it’s always handy to know the free things to do around a destination! LOL – very true, Sauvignon Blanc is one of the things New Zealand does very well. I love when cities offer free city walks. I feel like it’s a great way to learn about a new place but also a great way to get oriented for any adventures you may have over the next few days. I’d already heard great things about Auckland, but knowing there’s all this free stuff makes it even more appealing! Me too. It is one of the first things we typically look for in a city, and I was glad to find one in Auckland. Cornwall Park and all of those gorgeous cows would be my pick. The gardens are all lovely, too. Gracious. so many parks to choose from! LOL – I am afraid of cows. They seem to always be on my path. And, yes, I know, they are gentle creatures, but my brain fails when I see them and fear kicks in. What a comprehensive guide of things to do in Auckland. Will you keep this updated? Then I would like to bookmark it, as it will take us a number of years before we visit New Zealand. My wife and I keep saying that we save us NZ until we’re too old to travel any further. 😀 Already now I dread long distance flights. Greetings from the half-ozzie! My plan is to keep it updated, and much of it won’t change, as they are free regional parks, hikes, waterfalls, etc, that shouldn’t move. That first suggestion, that photo of the Mount Eden Auckland Volcano just blows me away with the immediate backdrop of the city right there! I think the flora within the city excites me the most, including the botanical garden and parks. When it comes to galleries / museums, I would definitely make time for the Auckland Art Gallery, especially to see the national collections over international. And then the markets, I bloody loooove flea markets and food markets, so I need to make sure I allocate enough time to really really browse! It’s one place I try to take all our visitors. It used to be that you could drive up to the top, but the closed is a few years back. It’s not a difficult walk, and so worth it for the views. Local parks always have a pull on me, great to see a nice variety here. FREE (!) entry to art museums is a massive plus anywhere. A pairing of those two would keep me quite occupied. I was always surprised that the art museums are free, but happy about it. What a fantastic list of the things to do in Auckland – and I love that most of them are free! I had no idea there was so much to see and do in the city. I think it’s time to pay Auckland another visit! I love free things too. I think visitors often think of the city as being super expensive, and it can be. But it also can be quite affordable in terms of activity. Thx for this fab post on Auckland. I’ve not yet been to New Zealand, but it’s definitely on my list! Have pinned your post. Thanks Doreen. I hope you find plenty of useful activities for your life when you visit. I hope you get here. One of my few regrets was not seeing NZ when we lived in Aus. Arguably, it’s not close, but it is closer than where I am now (London). Cheers! LOL – Isn’t that always the way. When it’s close by, there always tomorrow. Then one day you are gone and realised you missed an opportunity. Good overview! The place looks pretty… .but not the one I would go. I have friends who stay in Auckland for a long time, they told everything. It looks to me an almost same calm place as Finland (where I live). When I am traveling I look for busy cities, huge mountains or something rather extreme. Do you think Auckland would be a good place for me to go? Yes, I would imagine Finland to be quite a bit like New Zealand. Auckland is the port of entry into New Zealand, so if you come to our beautiful country, you will probably be here at least a night, so you may as well have a list of things to do . Near the airport is Butterfly Creek and Villa Maria Winery, so even if you can’t go far, you could visit those two. 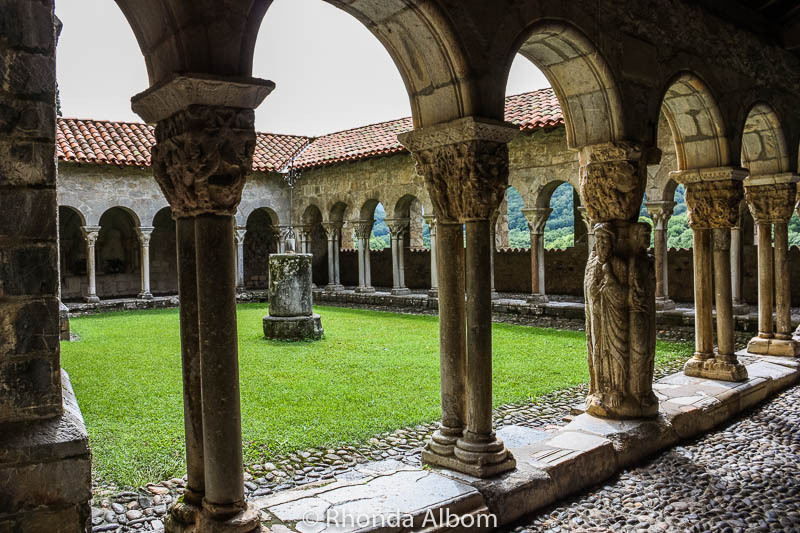 The photos are beautiful and isn’t it wonderful that there are so many free things to do! We love finding free things to do everywhere we go. Great to hear from a local. I haven’t been to La Cigalle Food before, but we have the Britomart Farmer’s Market on the list. Is that the one you’re referring to, or is there another one? I hope you make it here. New Zealand is gorgeous and full of exciting activities. One day, Rhonda. One day. Looks like a beautiful place to live. Thank you for broadening my horizons! It’s gorgeous here. New Zealand is well known for its greenery and Auckland certainly upholds that image despite the urban setting. You caught my attention right from the start with volcanos and military history. Both would be at the top of my sightseeing list. New Zealand has been on my list forever. One of these days I will make it there! There are plenty of volcanoes here in Auckland. As for the military, our history is shorter than most countries, but we do have some interesting options. Oh wow – I’m ready to take the next flight! Looks like a grand time. Hope you plan to stay a while. I always google free things to do in a city before I visit it. Me too. I hope this list will come up for people. It was a lot of work, and I want it to be useful for people. New Zealand is on my bucket list and the reason why I Went there by know is because I am not allowed to take more than 2 weeks holiday. I need at least one month to discover this beautiful land and one day I will make it there. Thank you for taking time to put together this impressive list. Depending on where you live now, I would agree. New Zealand is a country worth taking some serious time to explore. We have been here 16 years and still find new places. A month would be a great start. LOL – very true, there is always something to do, if you are looking for it. So, so beautiful! Thanks for sharing and if I’m ever there I will know what to do! This list will keep you busy for a while. Looks like I have to go back here! Always love to see those marvelous nature.. Yes, it’s time for another visit. Auckland is a pretty city with all the views you shared. So many things to do! With all the Auckland volcanoes and cones to climb, there are great views everywhere. You’ve stirred up happy memories Rhonda! I used to live in Auckland and the Muriwai Beach gannet colony was one of my favourite places in New Zealand (and we travelled a fair bit). It helps if you love magnificent birds but it’s also such a beautifully wild place with pounding surf and an endless stretch of beach! During the summer breeding season, the birds cover the cliffs and provide magnificent flying displays as they battle winds to land in their tiny nesting space! The cafe is welcoming too. Another favourite you mention is Tiritiri Matangi – a magical boat trip out to a bird lover’s paradise filled with birdsong. Finally, Shakespear Park – a stunning headland where you can ride your bike high up for views or wander along the beach. Look out for New Zealand dotterels nesting on the beach – their nests are scrapes in the sand that are easily trodden on. See the iconic pukeko or swamp hen wandering, an amazing blue bird with red legs that feature on pottery, postcards, you name it! Finally, Mount Eden for the best views in Auckland. Pick the early morning or out of peak season to avoid sharing the experience with coach loads of people! Thank you, Rhonda, for bringing back memories! I’m living in Norfolk, UK now – not as dramatic but every bit as beautiful in an English kind of way! Glad to bring up the memories. I agree, Muriwai Beach, and for me the Waitakere’s are one of the best spots in our beautiful country. We also love TiriTiri Matangi, and live pretty close, as we are out on the end of Whangaparaoa. In the last five years, Shakespear Park has become a bird sanctuary with a huge predator-proof fence protecting much of the parkland. Little spotted kiwi birds were even released earlier in the year. Being that I can walk to the park from my home, it will probably always top my list. we are going next year. Won’t have time to do all of them but I’m going to give it a good go! I hope you will get out of Auckland too. New Zealand is an amazing country. This list should just get you started. Great list – I’ll have to book mark it! I hope you find it useful on your next visit to Auckland. What a comprehensive guide to New Zealand! Sadly, I’ve never been but even more sad is I’ve always heard how expensive NZ was to visit, but this is quite to the contrary. Looks like there is so much green space, parks, and gardens to explore, and picnic at for free – and those volcanoes! How cool are they right around the city! New Zealand is expensive, on a world scale. Accommodations, food, clothing, cost of living, etc. However, if you look around there are plenty of free things to do. We love living here. If you love city life then there are tons of things to do. I’ll bet you could do post after post on this subject. 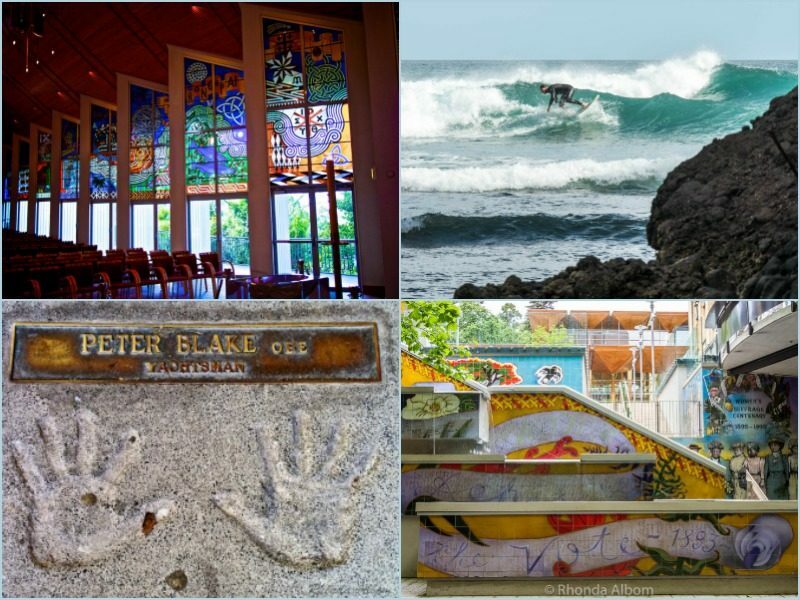 I think I have been doing post after post on some of this – the Auckland volcanoes, Shakespear park, beaches, surfing, etc. There is plenty of rural feel city things, plus the city is quite sprawling, out to rural areas. It’s always great when these amazing cities have so much to see and do for those on a budget! Auckland seems to have it all, from nature, to culture to adventure! You can spend a lot of money here, or not. The choices become yours. Wow, sounds like you’d never even need to leave the city. There’s enough to do there for a month or two at least. LOL – Honestly Alex, we have found enough to do for 16 years, and we are still finding more. I love living in Auckland. Thanks Hilary. I had fun gathering up the items for this list, and discovering so many new free places and options. There are SO MANY free things to do in Auckland, how cool is that? We were there last year and did a few of these, but hardly had 2 days in the city so missed a lot of things. But I am so in love with New Zealand that I am sure I’ll head back one day. Super list here, thanks for sharing. I started the post a while ago with the title of 10 free things to do. When I exceeded 75 I started grouping things together (there are 48 Auckland volcanoes, I only mention six special one.) It may be an expensive town, but it’s also loaded with free things to do. Saving my pennies to head down there someday. Thanks for wetting my taste for New Zealand. Hopefully, this list will require you to save a few less pennies.